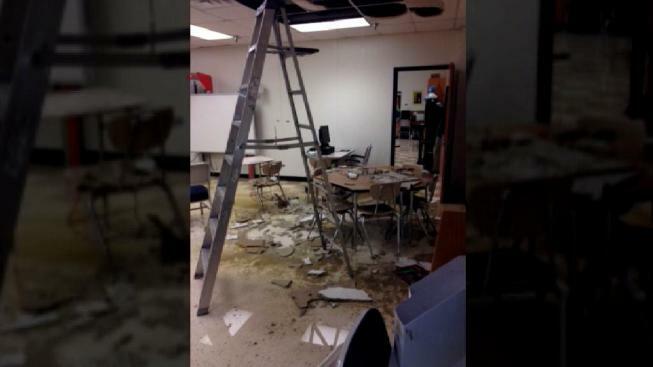 D.C.-area school districts have suffered nearly 200 water pipe bursts in recent weeks amid unseasonably cold temperatures, according to school maintenance records obtained by the News4 I-Team. Some have been damaging and required cancellation of classes, but the breaks pose a larger threat to school budgets. Montgomery County Public Schools officials said their district has already suffered 100 water pipe and sprinklers breaks this winter. A break at White Oak Middle School in Silver Spring flooded hallways with hot water, damaged ceiling tiles and required overnight repairs. Schools in Frederick County, Md. and Prince William County, Va. have each suffered 10 pipe bursts this winter. Fairfax County has experienced nearly 50 bursts, according to a school spokesman. Howard County schools have suffered 17 damaged pipes and sprinklers. Cleanup costs associated with pipe bursts are unclear, but school districts have expressed larger concerns about their heating bills. Frederick County Public Schools buildings supervisor Ray Barnes said his district has turned up the heating in its buildings to counteract the cold temperatures. Barnes said schools are now being maintained at standard “school day room temperatures” during nighttime and overnight hours to minimize the risk of pipe bursts. A Frederick County Schools spokesman said the district spends $11 million to heat school buildings during an average winter. Montgomery County Public Schools spent $33.7 million on heating costs in 2013. The unseasonable January cold threatens to raise the costs for the winter of 2014. A county report said broken heating units might’ve contributed to some of the district’s pipe bursts. A spokesman for the Washington DC Department of General Services said at least two DC Public Schools have suffered pipe bursts in recent weeks.